tuck is roseate spoonbill. The roseate spoonbill is one of only six species of spoonbills in the world. It is the only one found in the New World and the only one with the fantastic pale pink to bright rose coloration. from a pale pink to a brilliant rose pink. The saturation is diet dependant. The crustaceans the birds feed on, feed on algae that contain carotenes and other pigments that ultimately produce the color in the feathers. 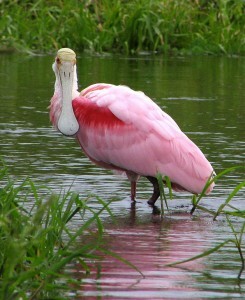 The roseate spoonbill ranges primarily from the Gulf States south to Chile and Argentina. comeback across most of their range. The Everglades, however, once a stronghold for roseate spoonbills is once again seeing a precipitous decline in numbers. The culprit according to a piece by Rene Ebersole in Audubon Magazine is poor water management. Spoonbills in the Everglades were making steady recovery until around 1979 when wetlands were drained and ditched to create housing developments and roads. That was followed by “upgrading” the canal system and increasing pumping stations to divert water for agricultural purposes. ults to feed the chicks. According to the article flood control and agriculture still take precedence over a balanced ecosystem, but the tide may be changing, at least enough to give the spoonbills a fighting chance. boundary of the Everglades Park and acts as a dam keeping the natural flow of water out. Time will tell if these policies continue and if they will be enough to revive the dwindling spoonbill population. The flip side of that equation is that in Louisiana, Mississippi, Texas and Georgia, Roseate spoonbills appear to be expanding their nesting range northward. I have seen pictures this summer of post-nest dispersal from Black Bayou National Wildlife Refuge in northeast Louisiana, Red Slough in southeastern Oklahoma and Huntington Beach State Park in North Carolina.